This was my first day back to work in over two weeks. It was great to get away from work for a little while and spend some time with the family for the holidays. I also got to spend my birthday with my parents and sister, which hasn’t happened in over maybe twelve years? My husband and I have spent a lot of time living overseas with the Air Force, so when we got the opportunity to be able to spend Christmas and New Year’s with my folks and sister, I jumped at it! 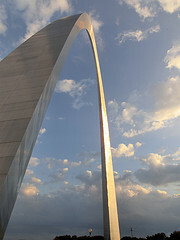 So we packed up the family and headed to the “Gateway to the West” for a little over two weeks. It was great. I was hoping, since we are from northern Texas, that we would have a snowy Christmas, but alas, the snow held out for New Year’s. And as a matter of fact, we just missed “snowmeggedon” that hit the night after we left and I’ve heard that they had over a foot of snow there – crazy. Monday after we get home dawns horribly early (at 5 a.m. actually) since right after my alarm went off, I thought someone broke into our house and tried to steal our dog from our room. (Our German Shepherd Dog, Leah, sleeps in our room at night and at 5 a.m., someone opened the door to our room and let her out.) So I’m shaking the husband awake and yelling at him that someone broke in and he’s jumping out of the bed and running into the hall only to discover that it was our daughter, who had snuck out of bed. 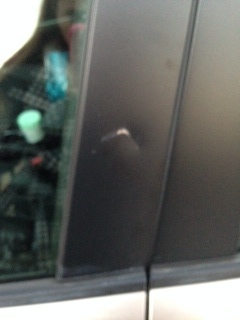 Next, I come out to my car to discover that someone had hit my car. Well, not like a hit-and-run kind of hit, but the kind that dents your door frame really good and makes you want to scream. It doesn’t look like much here, but flip that picture around and that is my car door frame. I know the person who did it, but since I didn’t “witness” the bump, I can’t really demand that they pay for it. I can’t even think about this without getting spun up. During all of this I’m battling what I suspect might be a really nasty sinus infection/head cold (yes, I need a tissue 🙂 ) and even a minor migraine. Okay, here’s where the story gets good – after getting done with the police report for the accident, I get to work and everyone there sings “Happy Birthday” to me and I get a piece of cake. *smiles* It was really great cake. Also, it was nice to get to see everyone again, even if work was crazy busy. So…how was your Monday? Did you get a chance to be with family this holiday season?